The connection between water scarcity and water security in the Indus Basin is often understood through attention to the decline of physical water supply per capita. But water insecurity at the individual and regional scales is as much about political and social structures as it is about the absolute (or physical) availability of a natural resource. Drawing on insights from the interdisciplinary tradition of political ecology, this chapter highlights the importance of examining the interaction of absolute and structural scarcity in the historically and geographically specific context of the Indus Basin in northwest South Asia (and especially Pakistan and India). This chapter first evaluates the Indus Basin’s ability to meet the basic physiological needs of the human population in terms of absolute supplies of water. 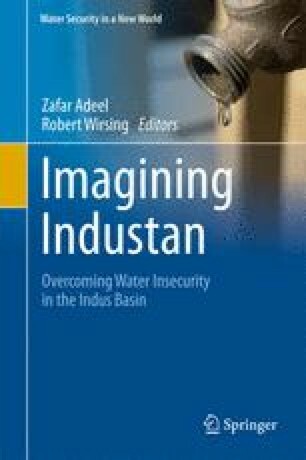 The next section argues that the fundamental sociopolitical structures that shape the structural scarcity of water in the Indus can be rooted in the agroecological transformations of the basin since the late nineteenth century. The final section analyzes Indus Basin water security in the context of climate change through attention to the interaction of absolute and structural water scarcity.